You want to buy antibodies? 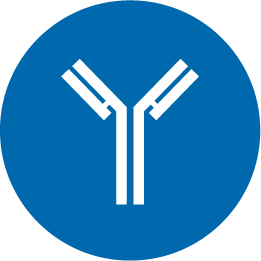 At Biomol you will find the right polyclonal or monoclonal antibody for your research. Select conjugated (labeled) primary antibodies (eg. with FITC, biotin) for direct immunodetection of your antigens or primary plus secondary antibodies for indirect antigen detection. Antibodies of immunoglobulin class G (IgG) are predominantly used for immunological detection. They consist of four protein chains: two light chains (L) having a molecular weight of 25 kDa as well as two heavy chains (H) of 50 kDa each. Linked by disulfide bridges heavy and light chains (H + L) together form the well known antibody structure. Enzyme digestion of these immunoglobulins produces antibody fragments with advantagous properties for certain experiments. Human CD63 is expressed on activated platelets and also on monocytes and macrophages. CD63 contains four hydrophobic transmembrane regions and is a member of the tetraspan family. CD63 appears to be involved with cell adhesion and associates with VLA-3 and VLA-6 integrins. In a colon cancer model, it has been correlated to metastatic potential.